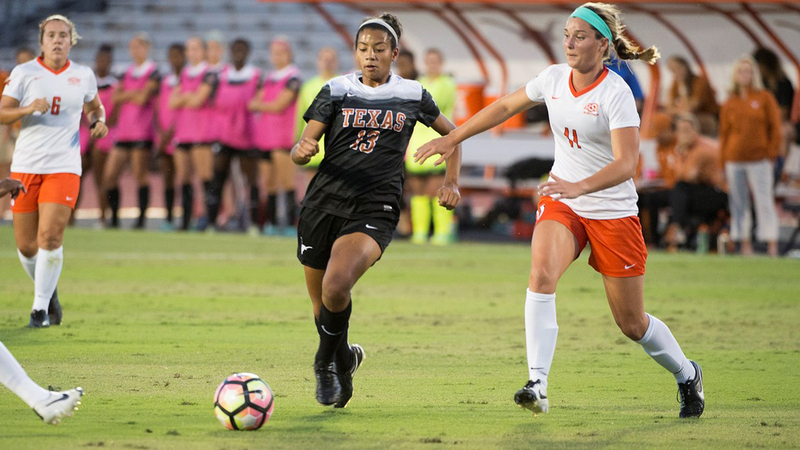 After she led the Big 12 in goals, assists and points during the regular season, it was hard to imagine anyone other than Texas forward Cyera Hintzen being named Big 12 Offensive Player of the Year (photo courtesy of texassports.com). AUSTIN, Texas — Junior forward Cyera Hintzen became the first Texas player to be named Big 12 Offensive Player of the Year when she claimed the honor Tuesday. Hintzen was one of four players for the No. 18 Longhorns to claim individual honors from the team. First-year midfielder Julia Grosso earned half of the conference’s Freshman of the Year award — she shared the honor with TCU’s Messiah Bright — while midfielder Haley Berg joined Hintzen in earning first-team All-Big Honors. Grosso was named second-team All-Big 12 and earned a spot on the conference’s All-Freshman team, as did forward Mackenzie McFarland. The announcement raise to 67 the number of Texas players who have earned All-Big 12 nods, while McFarland and Grosso increased to 34 the number of Longhorns to snag All-Freshman accolades from the conference. A member of the Missouri Athletic Club’s Hermann Trophy preseason watch list, Hintzen leads the Big 12 in 2018 in goals (10), assists (9) and points (29), and has a chance to become just the third player in the conference’s history to finish first in all three categories. Grosso missed eight games this season, including the first six Big 12 matches, while training with the Canadian Women’s Senior National Team, but made an impression upon her return, starting nine of 11 matches and scoring a pair of goals in a span of just 6:04 in UT’s 4-0 win over Kansas State. The 2017 Big 12 Freshman of the Year, Berg scored six goals this season and handing out three assists, for a total of 15 points. She has started all 19 UT matches this season and mustered multiple-point games seven times. McFarland played in 18 matches, starting twice, and converting both of her shots on goal into goals for the Longhorns. The No. 3 seed at the 2018 Big 12 Championship at Swope Soccer Village in Kansas City Mo., Texas advanced to Friday’s semifinal after battling Kansas to a scoreless draw in the first round and subsequently advancing on penalty kicks. The Longhorns will face second-seeded West Virginia at 7 p.m. in a match that will be broadcast live on the Big 12 Digital Network through big12sports.com.